This claw ring is composed of silver plated ( brass ) stampings adorned with a small faceted ( glass ) purple amethyst cabochon. This claw ring is adjustable and will fits most standards sizes. 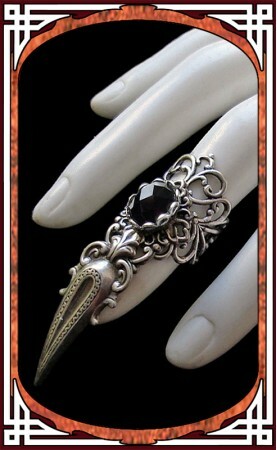 This claw ring is composed of silver plated ( brass ) stampings adorned with a small faceted ( glass ) black cabochon. 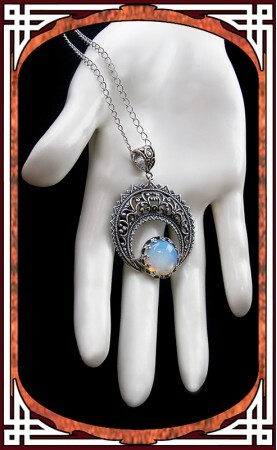 This claw ring is composed of silver plated ( brass ) stampings adorned with a small faceted ( glass ) white opal cabochon. 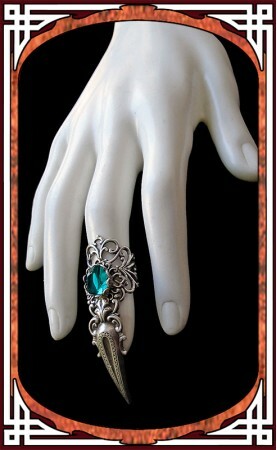 This claw ring is composed of silver plated ( brass ) stampings adorned with a small faceted ( glass ) night blue cabochon. 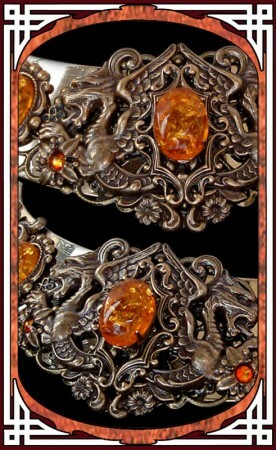 This claw ring is composed of silver plated ( brass ) stampings adorned with a small faceted ( glass ) red ruby cabochon. A little wink to the most famous Wizard of English literature ! 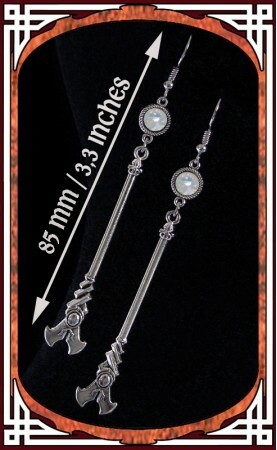 This bookmark is composed of a metal signet, a small silver charm and a medallion representing the Snake Blazon from one of the House of the popular magic school. ( picture framed under half glass sphere ). 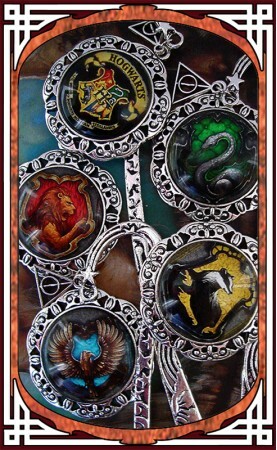 This bookmark is composed of a metal signet, a small silver charm and a medallion representing the Lion Blazon from one of the House of the popular magic school. ( picture framed under half glass sphere ). 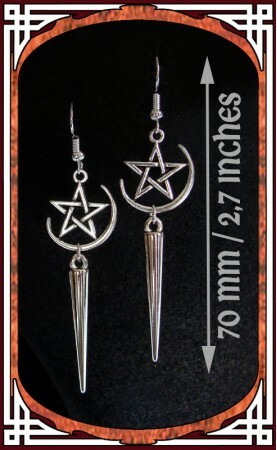 This bookmark is composed of a metal signet, a small silver charm and a medallion representing the Badger Blazon from one of the House of the popular magic school. ( picture framed under half glass sphere ). 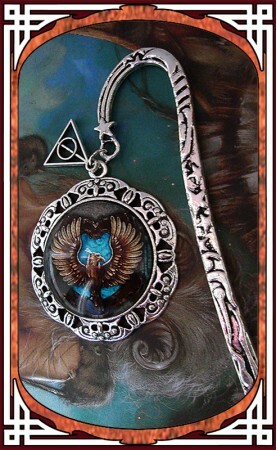 This bookmark is composed of a metal signet, a small silver charm and a medallion representing the Eagle Blazon from one of the House of the popular magic school. ( picture framed under half glass sphere ). 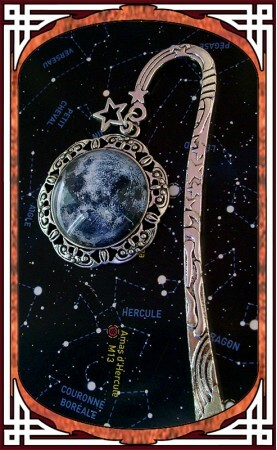 This galaxy bookmark is composed of a metal signet, a small star charm and a medallion representing a night sky. ( picture framed under half glass sphere ). 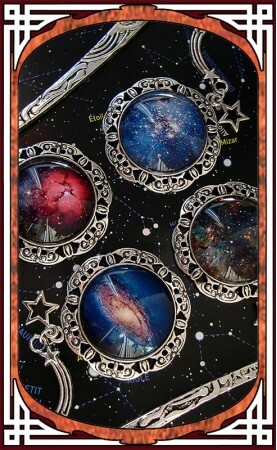 This galaxy bookmark is composed of a metal signet, a small star charm and a medallion representing a red nebula. ( picture framed under half glass sphere ). 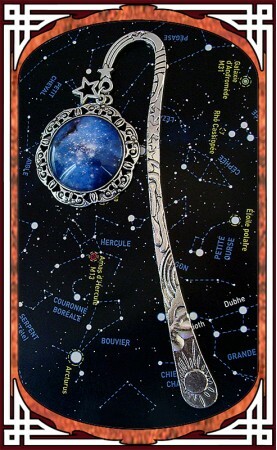 This galaxy bookmark is composed of a metal signet, a small star charm and a medallion representing a blue nebula. ( picture framed under half glass sphere ). 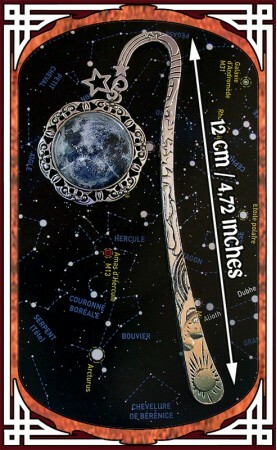 This galaxy bookmark is composed of a metal signet, a small star charm and a medallion representing the moon. ( picture framed under half glass sphere ). 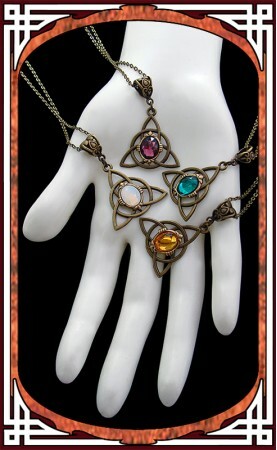 With this "magical potion" necklace composed of a small winged glass vial filled with gold glitters, a tiny cork stopper and a silver star charm. 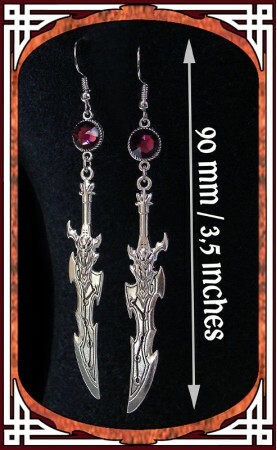 Vial length : 1,96 inches (55mm). 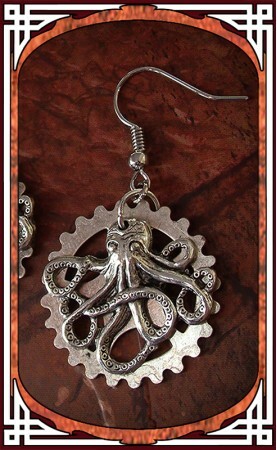 This necklace closes with a lobster clasp and extender chain. 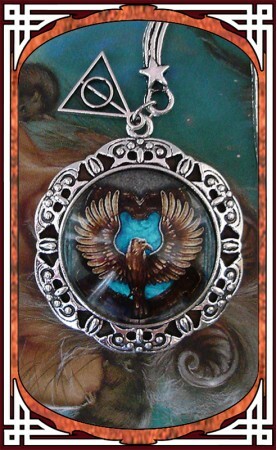 The medallion measures 0,98 inch (25mm) diameter. 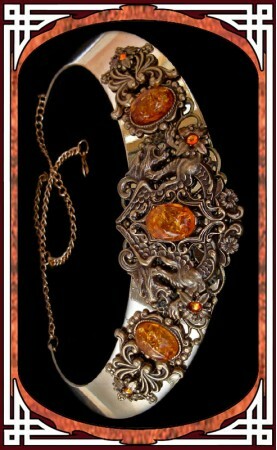 This neckace closes with lobster clasp and extender chain. 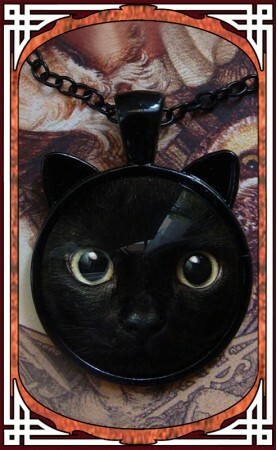 This "spirit animal" necklace is composed of small medallion representing a black cat whose setting is adorned with small pointed ears. 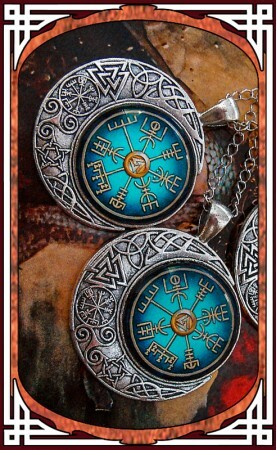 The medallion measures 1,18 inch (30mm). 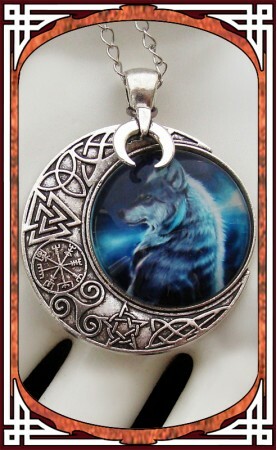 This "spirit animal" necklace is composed of small medallion representing a night wolf whose setting is adorned with small pointed ears. 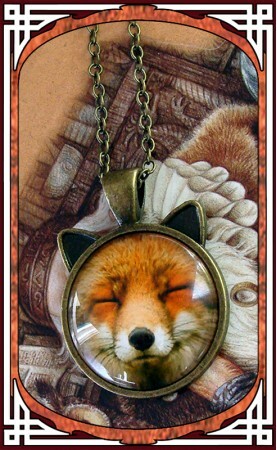 This "spirit animal" necklace is composed of small medallion representing a smiling fox whose setting is adorned with small pointed ears. 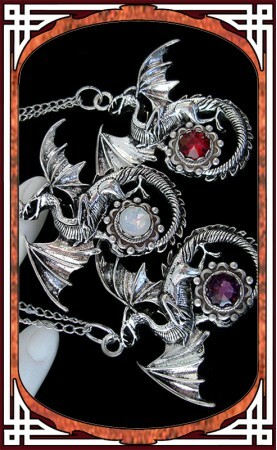 This gothic necklace is composed of a silver plated bat pendant adorned with a red garnet Swarovski crystal. 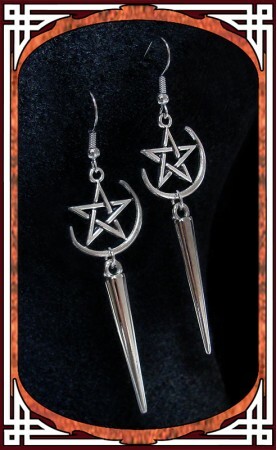 This bat necklace is also available in black. 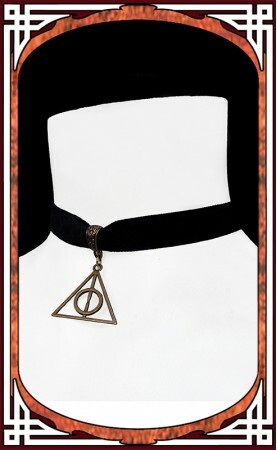 This choker is composed of a black velvet ribbonand a medallion representing the Snake Blazon from one of the House of the popular MagicSchool. ( picture framed under half glass sphere ). 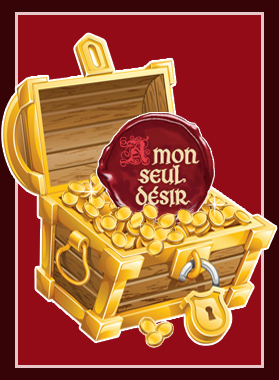 This choker is composed of a black velvet ribbonand a medallion representing the Lion Blazon from one of the House of the popular MagicSchool. ( picture framed under half glass sphere ). 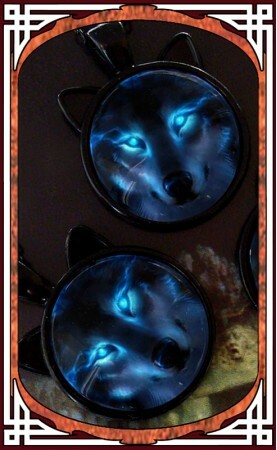 This choker is composed of a black velvet ribbonand a medallion representing the Badger Blazon from one of the House of the popular MagicSchool. ( picture framed under half glass sphere ). 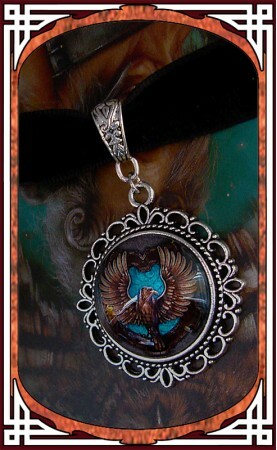 This choker is composed of a black velvet ribbonand a medallion representing the Eagle Blazon from one of the House of the popular MagicSchool. ( picture framed under half glass sphere ). 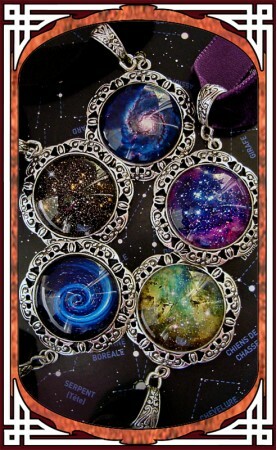 With this galaxy necklace composed of a black velvet ribbon and a medallion representing a galactic spiral. ( picture framed under half glass sphere ). 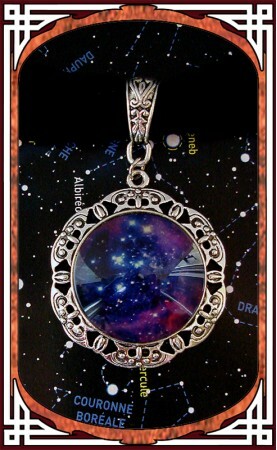 With this galaxy necklace composed of a purple velvet ribbon and a medallion representing a nebula. ( picture framed under half glass sphere ). 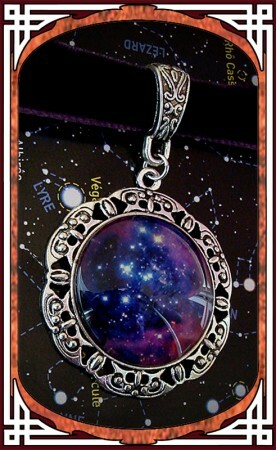 With this galaxy necklace composed of a black velvet ribbon and a medallion representing a nebula. ( picture framed under half glass sphere ). 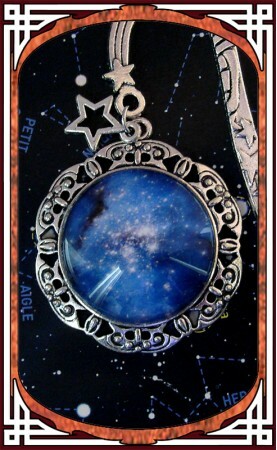 With this galaxy necklace composed of a black velvet ribbon and a medallion representing a night sky. ( picture framed under half glass sphere ). 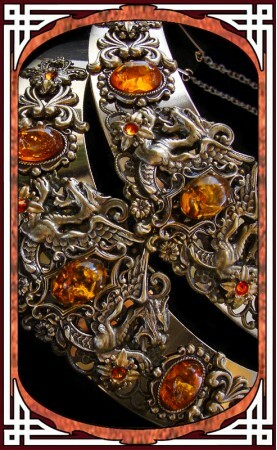 This medieval necklace is composed of a brass plated dragon pendant adorned with a (7mm) red Siam Swarovski rhinestone. 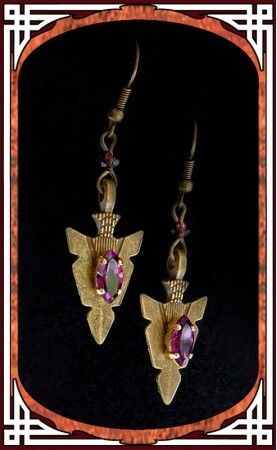 This medieval necklace is composed of a brass plated dragon pendant adorned with a (7mm) purple amethyst Swarovski rhinestone. 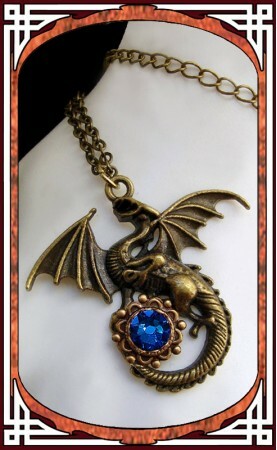 This medieval necklace is composed of a brass plated dragon pendant adorned with a (7mm) fire opal Swarovski rhinestone. This medieval necklace is composed of a silver plated dragon pendant adorned with a (7mm) purple amethyst Swarovski rhinestone. 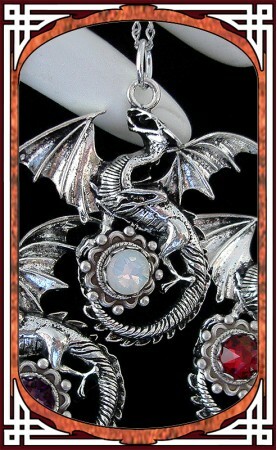 This medieval necklace is composed of a silver plated dragon pendant adorned with a (7mm) white opal Swarovski rhinestone. 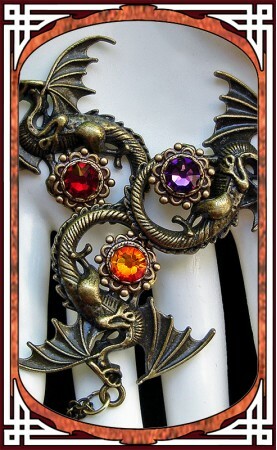 This gothic medieval inspired necklace is composed of a medallion representing a small dragon with a purple rose. 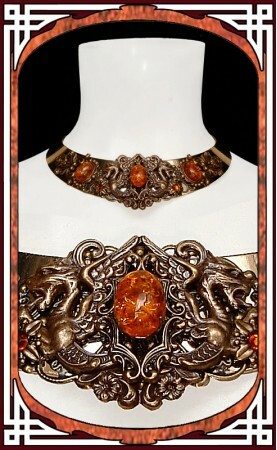 This medieval necklace is composed of bronze torque adorned with various ( brass ) stampings and flourishes, a roaring lion head and two small red Swarovski rhinestones. 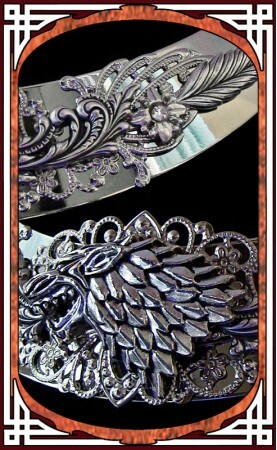 This torque necklace closes with lobster clasp and extender chain. 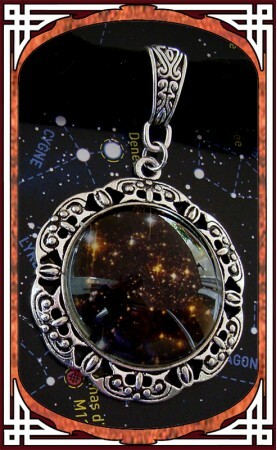 With this galaxy necklace composed of a red velvet ribbon and a medallion representing a red planet. ( picture framed under half glass sphere ). 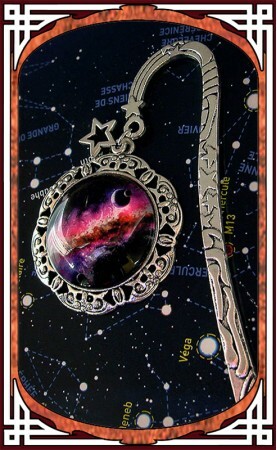 With this galaxy necklace composed of a black velvet ribbon and a medallion representing the Moon. ( picture framed under half glass sphere ). 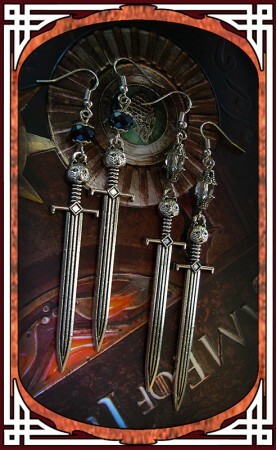 For those who love medieval fantasy readings ! 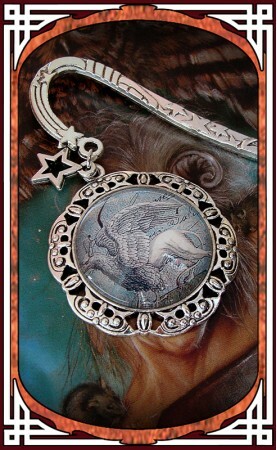 This griffin bookmark is composed of a metal signet, a small star charm and a medallion representing a splendid gryphon. ( picture framed under half glass sphere ). 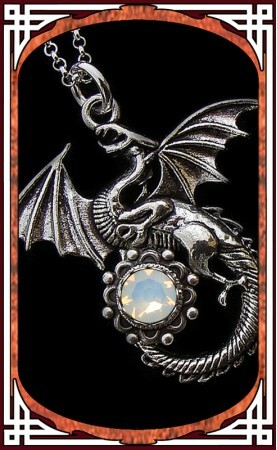 This dragon bookmark is composed of a metal signet, a small star charm and a medallion representing a small purple dragon. ( picture framed under half glass sphere ). 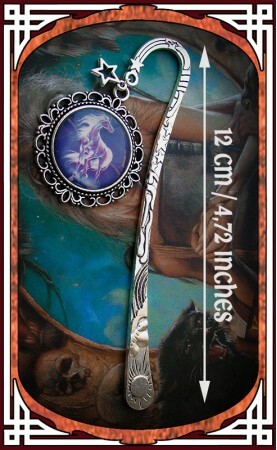 This Pegasus bookmark is composed of a metal signet, a small star charm and a medallion representing a marvelous Winged Horse. ( picture framed under half glass sphere ). 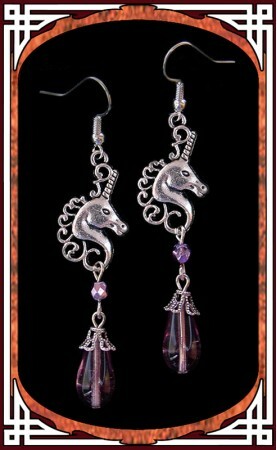 For all passionate of fantasy and mythical creatures ! 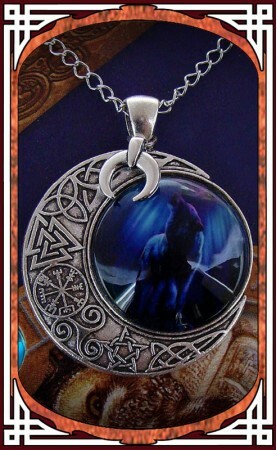 With this unicorn necklace composed of a blue velvet ribbon and a medallion representing a fabulous unicorn. ( picture framed under half glass sphere ). 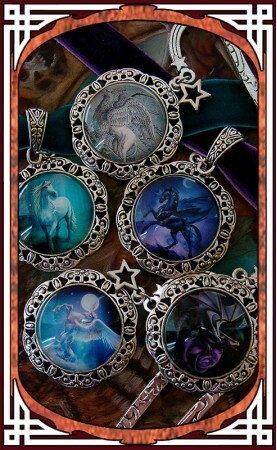 For all true passionate of fantasy and mythical creatures ! 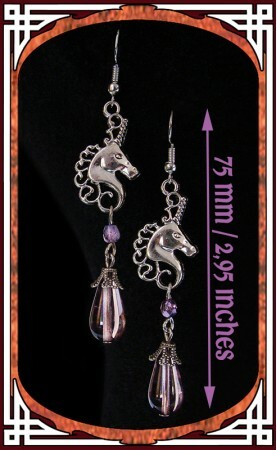 With this unicorn necklace composed of a purple velvet ribbon and a medallion representing a fearsome winged unicorn. ( picture framed under half glass sphere ). 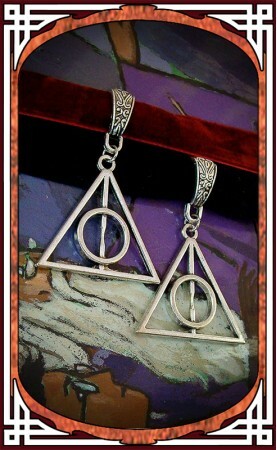 This necklace is composed of a black velvet ribbon and a silver pendant representing the famous symbol of the Deathly Hallows. 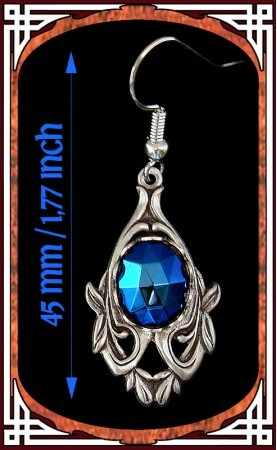 Height of the pendant : 1,18 inch (3 cm). 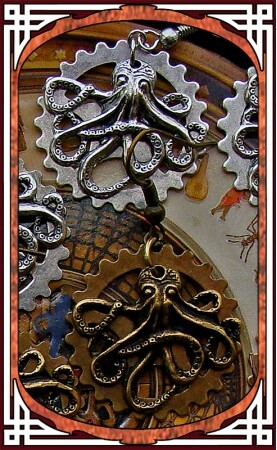 This necklace is also available in red & silver / black & bronze / red & bronze. 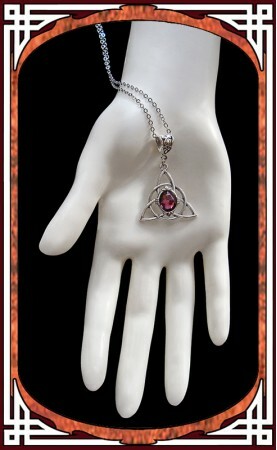 This necklace is composed of a red velvet ribbon and a silver pendant representing the famous symbol of the Deathly Hallows. 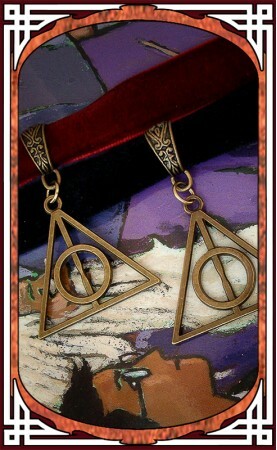 This necklace is composed of a black velvet ribbon and a bronze pendant representing the famous symbol of the Deathly Hallows. 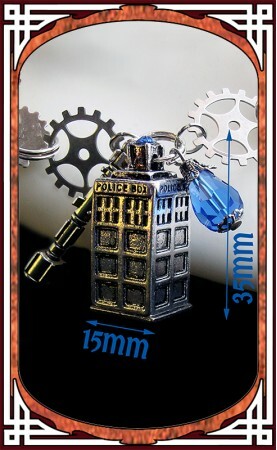 This necklace is also available in red & silver / black & silver / red & bronze. 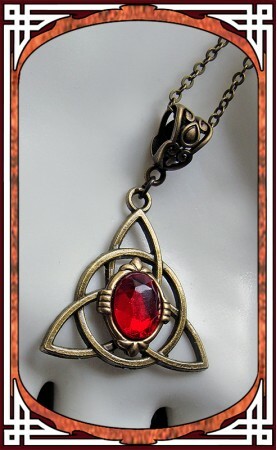 This necklace is composed of a red velvet ribbon and a bronze pendant representing the famous symbol of the Deathly Hallows. 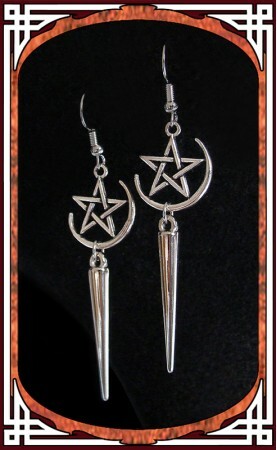 This necklace is also available in red & silver / black & silver / black & bronze. 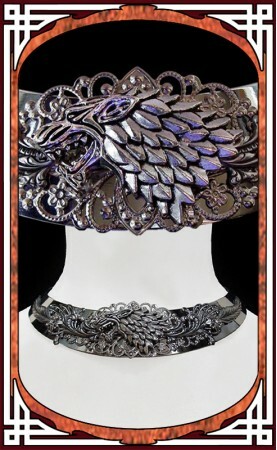 This medieval necklace - a small wink to the "Game of Thrones" saga - is composed of metal torque necklace adorned with various silver plated ( brass ) stampings, flourishes, two small crystal Swarovski rhinestones and a wolf head symbolizing the famous House Stark. This claw ring is composed of silver plated ( brass ) stampings adorned with a small faceted ( glass ) emerald green cabochon. 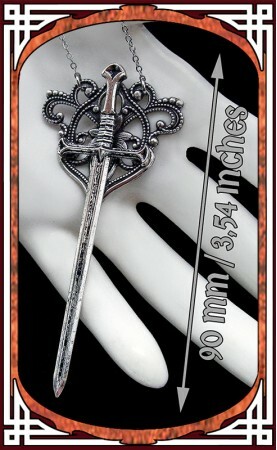 This "dragon & sword" bookmark is composed of a dragon signet, a small dragon charm and a finely detailed sword pendant. 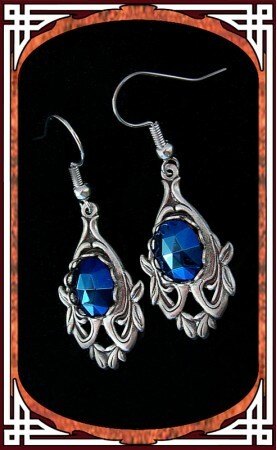 This elven necklace is composed of metal torque necklace adorned with various silver plated ( brass ) stampings, flourishes, two winged horses and two small clear crystal Swarovski rhinestones. 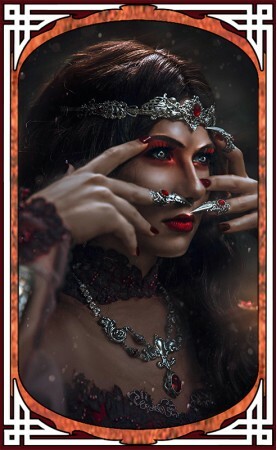 This necklace is composed of metal torque necklace adorned with various silver plated ( brass ) stampings, a small lion's head surronded with thorns and roses ( metal flowers whose center is adorned with red Swarovski rhinestones ). This romantic necklace composed of a black velvet ribbon and a medallion representing "Proserpine" by the artist Dante Gabriel Rossetti. This romantic necklace composed of a black velvet ribbon and a medallion representing "The Valkyrie's Vigil" by the artist Edward Robert Hughes. This romantic necklace composed of a black velvet ribbon and a medallion representing "The Accolade" by the artist Edmund Blair Leighton. This necklace is composed of gold torque adorned with various ( brass ) stampings and flourishes, two winged snakes, a Swarovski cabochon and two red Siam Swarovski rhinestones. 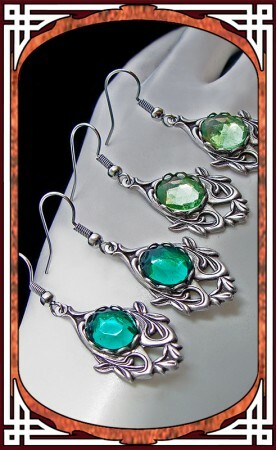 This mythical necklace is composed of silver metal torque adorned with various ( brass ) stampings and flourishes, two silver plated symmetrical snakes, a green emerald pear shaped cabochon and two small Swarovski rhinestones. This medieval necklace is composed of black satin cord with finely worked Blazon pendant adorned with small green emerald Swarovski rhinestone. 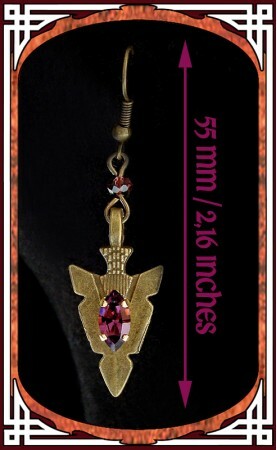 This tribal necklace is also available in crystal and red ruby. This medieval necklace is composed of black satin cord with finely worked Blazon pendant adorned with small clear crystal Swarovski rhinestone. 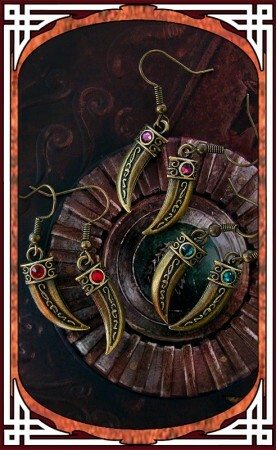 This tribal necklace is also available in emerald green and red ruby. This medieval necklace is composed of black satin cord with finely worked Blazon pendant adorned with small ruby red Swarovski rhinestone. 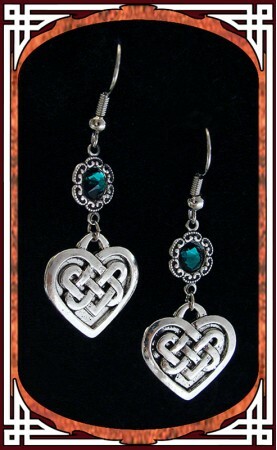 This tribal necklace is also available in crystal and emerald green. 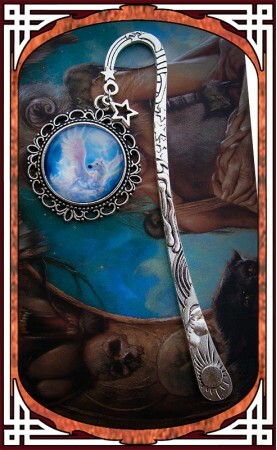 This bookmark is composed of a metal feather signet, a small silver starm charm and a medallion with the well-known Levitation Spell. ( picture framed under half glass sphere ). 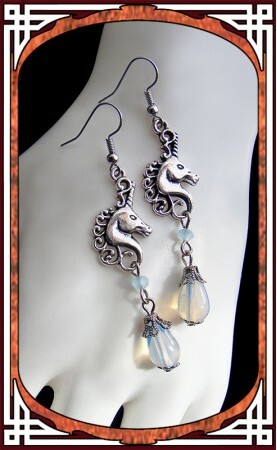 Dedicated to all lovers of fantasy and mythical creatures ! 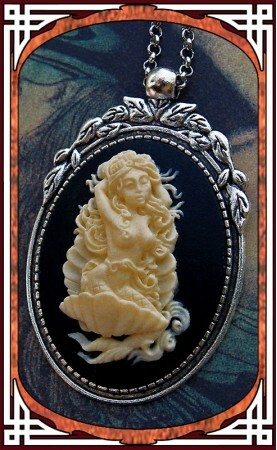 With this mythical necklace composed of a black velvet ribbon and a large ( resin ) cameo representing a fabulous winged unicorn. 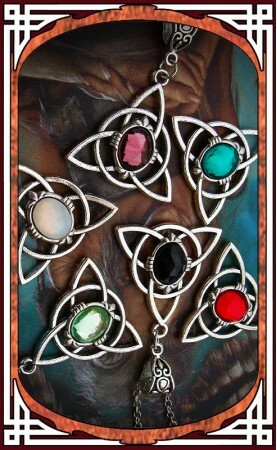 This celtic necklace is composed of silver metal torque adorned with various ( brass ) stampings and flourishes, a Thor Hammer and four white opal Swarovski rhinestones. 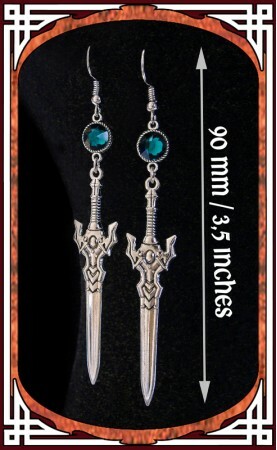 This viking necklace closes with lobster clasp and extender chain. 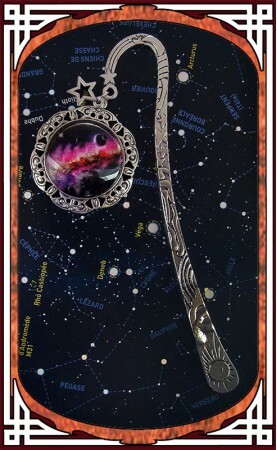 This galaxy bookmark is composed of a metal signet, a small star charm and a medallion representing the interstellar space. ( picture framed under half glass sphere ). 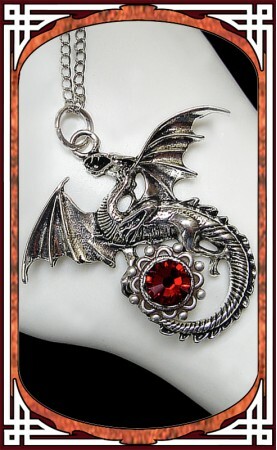 This medieval necklace is composed of silver metal torque adorned with various ( brass ) stampings and flourishes, two symmetrical dragons, a red Siam Swarovski cabochon and two small Swarovski rhinestones. 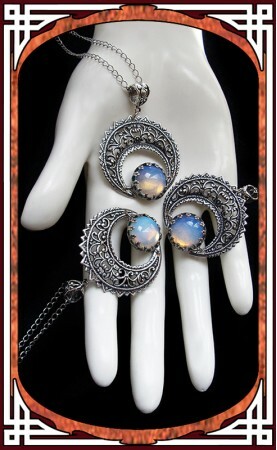 This elven necklace is composed of a Crescent Moon Goddess gripping a white opal ( glass ) cabochon. 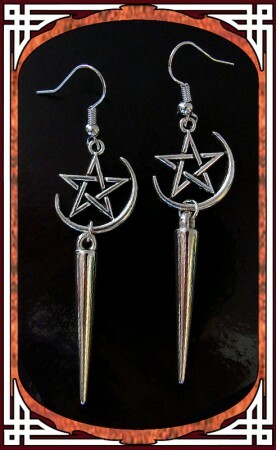 This wiccan necklace closes with lobster clasp and extender chain. 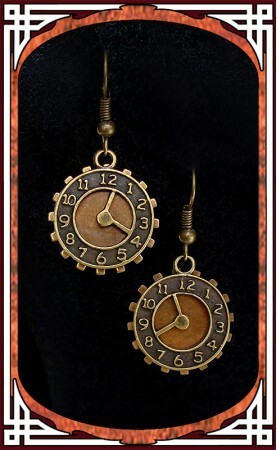 This steampunk necklace is composed of a bronze glass vial containing real timepieces and a small charm representing a watch dial. This gothic necklace is composed of a silver plated brass cross adorned with five emerald green Swarovski crystals. 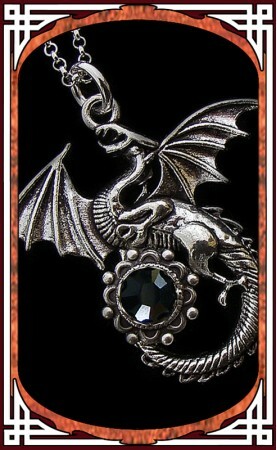 This gothic necklace is composed of a silver plated bat pendant adorned with a black Swarovski crystal. 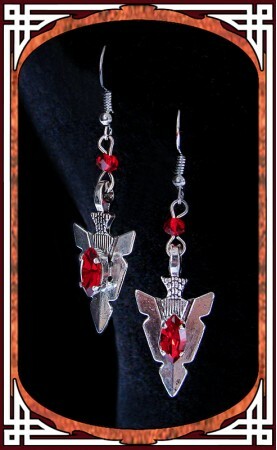 This bat necklace is also available in red garnet. 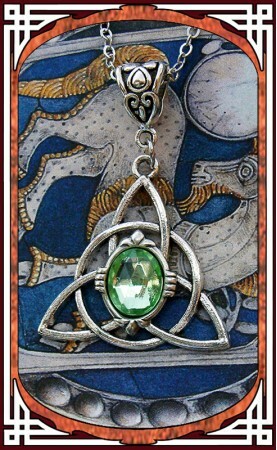 This medieval fantasy inspired necklace is composed of a bronze setting adorned with a green ( glass ) dragon's eye. 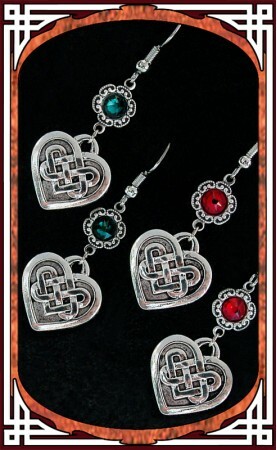 This necklace is also available in MAGENTA , ORANGE, PURPLE and EMERALD. 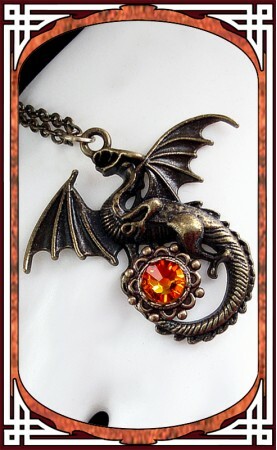 This medieval fantasy inspired necklace is composed of a bronze setting adorned with a yellow-orange ( glass ) dragon's eye. 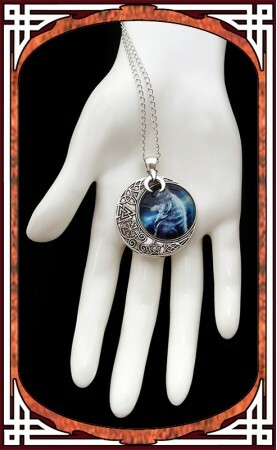 This medieval fantasy inspired necklace is composed of a bronze setting adorned with a purple-blue ( glass ) dragon's eye. 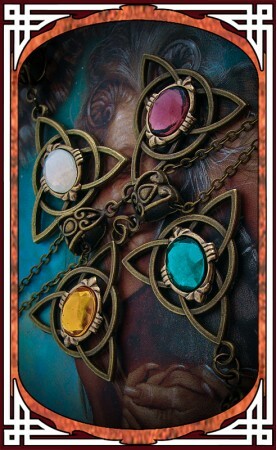 This necklace is also available in MAGENTA, ORANGE, GREEN and EMERALD. 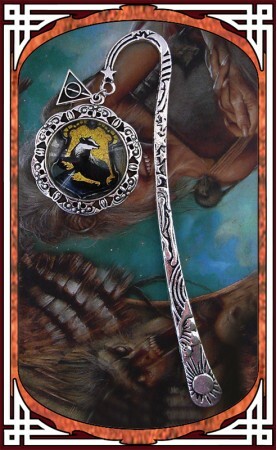 This arrowhead necklace is composed of a finely worked silver pendant with a black satin cord. 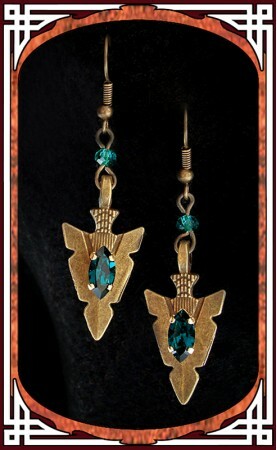 This tribal necklace is also available in bronze color. 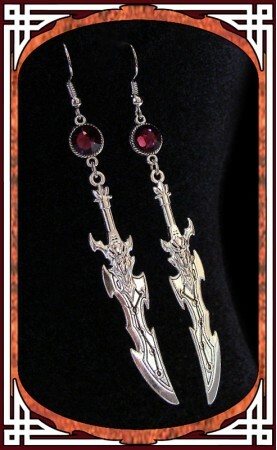 This gothic necklace is composed of a silver plated brass cross adorned with five red ruby Swarovski crystals. 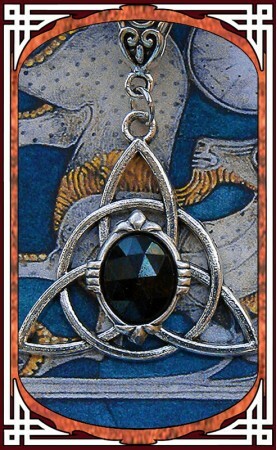 This arrowhead necklace is composed of a finely worked pendant with a black satin cord. 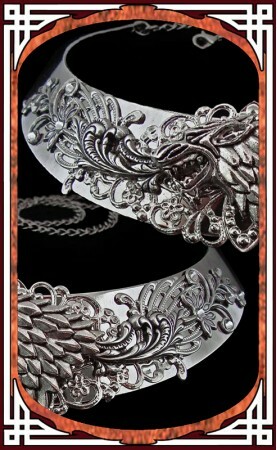 This tribal necklace is also available in silver color. 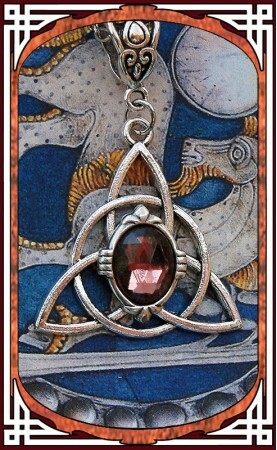 This medieval fantasy inspired necklace is composed of a silver setting adorned with a magenta-purple ( glass ) dragon's eye. 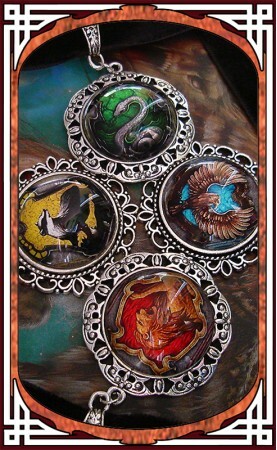 This necklace is also available in GREEN , ORANGE, PURPLE and EMERALD. 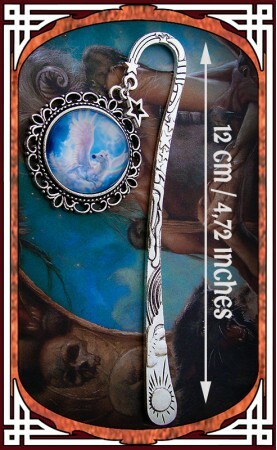 This gothic necklace is composed of two bird claws gripping a blue abalone cabochon. 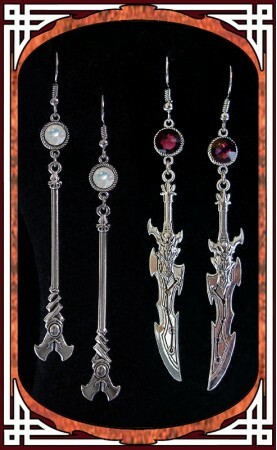 This claws necklace closes with lobster clasp and extender chain. 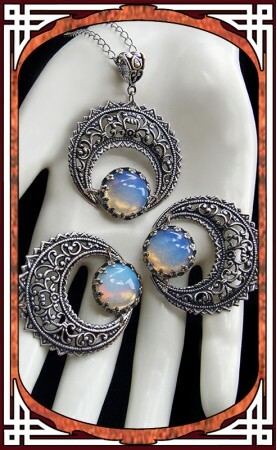 This necklace is also available in white opal version. 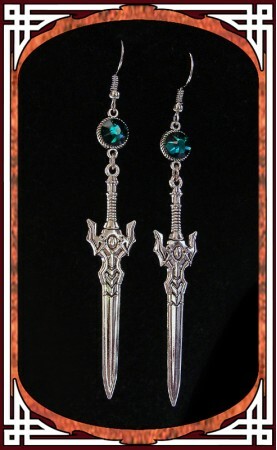 This medieval fantasy inspired necklace is composed of a silver setting adorned with a emerald green ( glass ) dragon's eye. 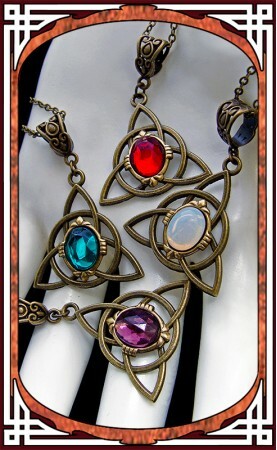 This necklace is also available in GREEN , ORANGE, PURPLE and MAGENTA. 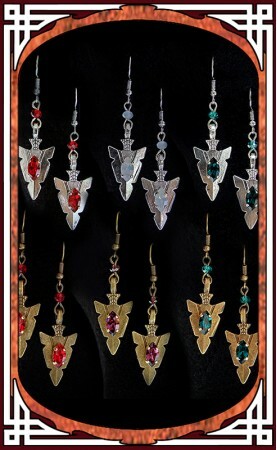 This medieval necklace is composed of silver metal torque adorned with various ( brass ) stampings and flourishes, two silver plated winged snakes, a emerald green ( glass ) cabochon and two small Swarovski rhinestones. This snake necklace closes with lobster clasp and extender chain. 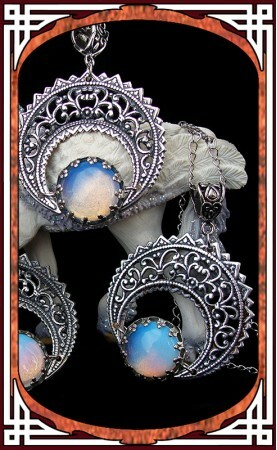 This elven necklace is composed of a Crescent Moon pendant adorned wiith a smooth white opal ( glass ) cabochon. 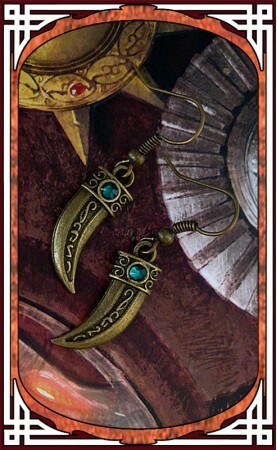 This crescent moon necklace closes with lobster clasp and extender chain.